The convincing victory - albeit against a 10-man team for more than 45 minutes - was in stark contrast to the team's performances in South Africa four years ago, when the highly paid squad failed to win a single match and was sent home in a disgrace after going on a training strike. 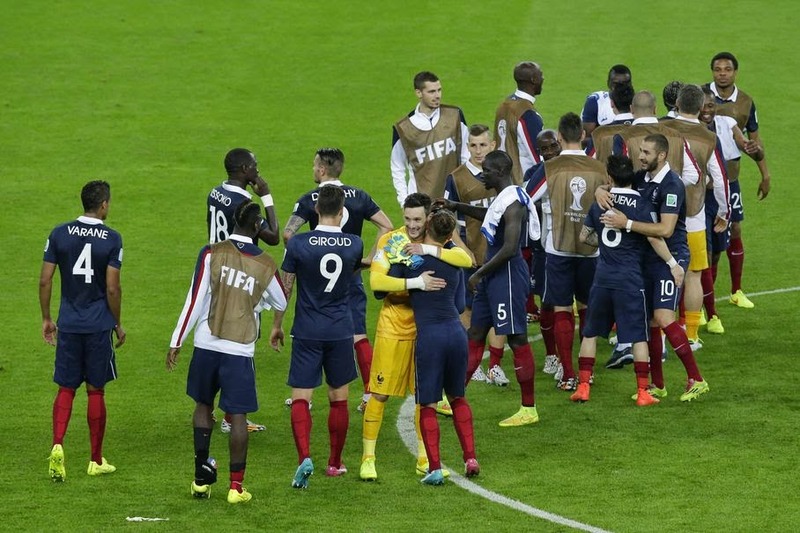 "Winning 3-0 at a World Cup isn't easy," France coach Didier Deschamps said. "(The players should) savor the moment, there's nothing more wonderful. We're going recover and then go again in five days' time." Benzema's first goal came from the penalty spot just before halftime after Wilson Palacios was sent off with his second yellow card for charging into the back of Paul Pogba. The Real Madrid striker calmly slotted the ball to the left of Noel Valladares to give the French a deserved lead going into the break. 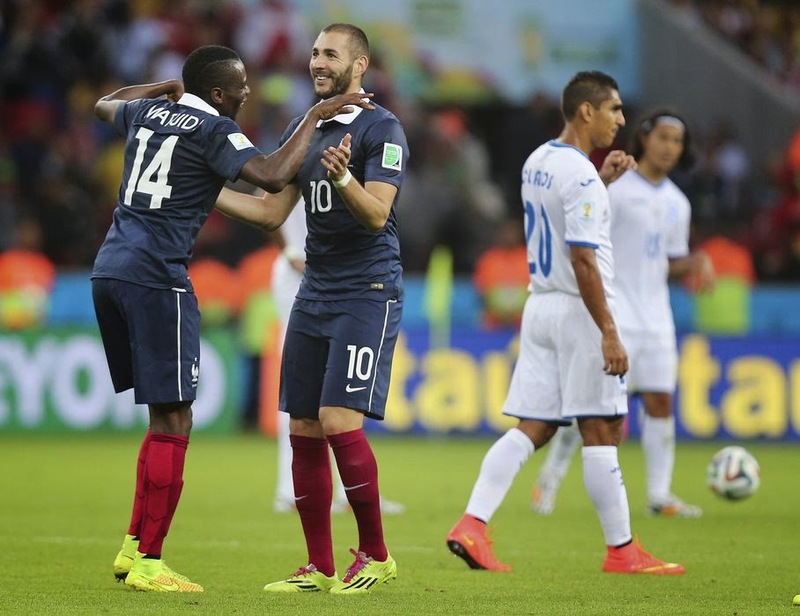 "It's my first World Cup and I think we're all satisfied with the result," Benzema said. "It was important to win this match." With Honduras down to 10 men, France didn't take long to double the score, thanks again to the Real Madrid striker and the first decisive use of goal line technology in a World Cup. "Obviously Karim did well because he scored and he was decisive for us," Deschamps said. "But I was also pleased with our team spirit and our collective way of playing. They defended with a lot of aggression; it was pretty difficult to find an opening even though we hit the crossbar twice. The sending off changed things. We had a lot of space and could take advantage of it." 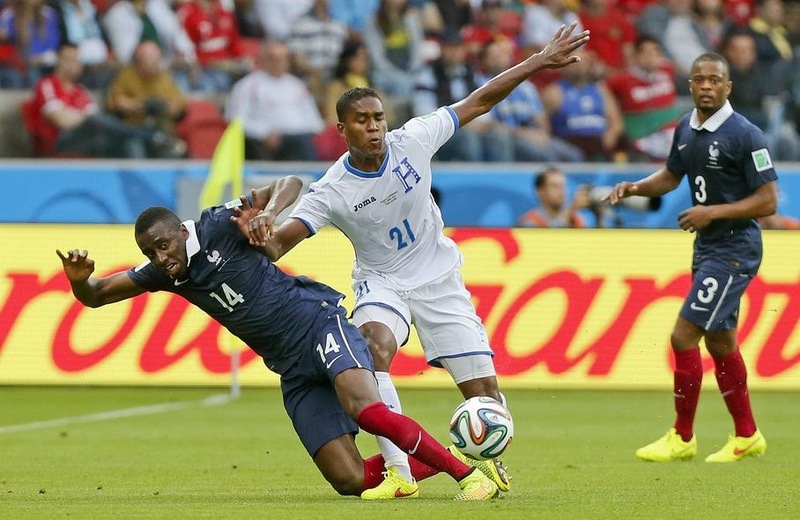 The Hondurans' physical approach succeeded in stifling some of the approach play of the French, but the 1998 champions looked especially dangerous down both flanks in the first half hour. Blaise Matuidi connected with a cross but saw his header tipped onto the bar by Noel Valladares, while Antoine Griezmann, playing in place of Arsenal striker Olivier Giroud, also rattled the woodwork after climbing high in the six-yard box. French keeper Hugo Lloris didn't have to touch the ball until the 31st minute and didn't have to make a save all night against a team that managed just 37 percent of the possession. 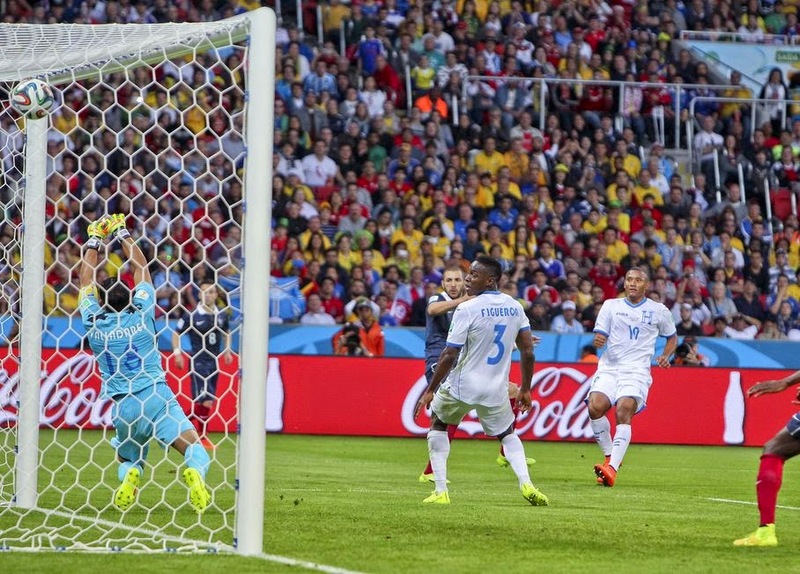 "I think they played better than us so there are no excuses," said Honduras coach Luis Suarez. "There are certain things that we will have to improve in the future, but sometimes it is difficult to play with a man less, especially when you are facing a team that's very well organized." He denied his team had played rough. "I don't think we crossed the line," he said. "Of course we have a strong and intense style, but we respect the game." The only downside for the French fans was that the teams' national anthems weren't played before the game because of an apparent malfunction - meaning they didn't get a chance to sing "La Marseillaise." FIFA later saidt was a malfunction and promised that it wouldn't happen again.